Click below to view the answers to some frequently asked questions. What’s the difference between the RM/AVR 15 and the RM/AVR 15 Plus? The Torus Power RM or AVR 15 Plus weighs over 30 pounds more than the standard RM or AVR 15 model, yet the differences might not be easily apparent. The standard RM 15 and AVR 15 units are both two rack units in height (2U), or 3.5” tall. The Plus models use a more robust and advanced transformer mounting process that requires a larger chassis. The RM 15 Plus is three rack units (3U) in height, and the AVR 15 Plus is a stout four rack units (4U) tall. So why do we need to use a larger chassis for the Plus models? One significant difference with the Plus models is that the Toroidal Isolation transformer is physically isolated from the chassis of the unit. Yes, the isolation transformer is isolated! The transformer is surrounded by a metal retaining band that suspends the transformer above the bottom plate of the chassis. This retaining band is mounted to the chassis using four fully isolated mounting posts. See figure 1 below. In addition to the retaining band, we use a thick layer of neoprene rubber between the metal surface and the transformer, so the transformer never contacts a metal surface…it is fully isolated from its surroundings! In audiophile applications we know that metal surfaces can resonate unwanted noise and vibration, so this mounting process ensures the quietest operating conditions possible. That is not the only difference. Much of the difference in the Plus models is actually in the transformers. The transformers in the RM 15 and AVR 15 are somewhat flatter in their geometry so they can fit in the 2U chassis. In comparison, the transformers in the Plus models are designed with the more traditional doughnut shape of a standard toroidal transformer. The Plus transformers are heavier because they are taller and because they contain more steel and more copper. As you might expect, the Plus transformers are able to deliver higher levels of instantaneous current. The Plus models are recommended for audiophile grade systems that may include a powered subwoofer or even a pair of mid-powered monoblock power amplifiers. 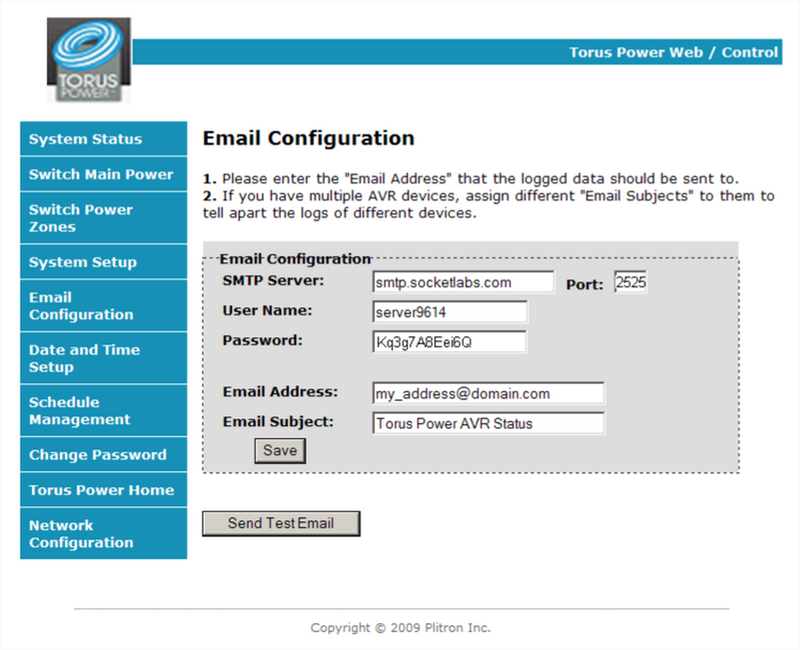 We encourage you to send us your equipment list so we can help identify the best Torus Power model for your system. We even have a convenient form that you can use to tell us what you’ve got! Here’s the link. How do I select the right Torus for my system? Here is a general guideline: High end audio and video systems can benefit the most from using RM 15 Plus or RM 20 models. The RM 15 Plus allows the maximum amount of current possible to be delivered on an instantaneous basis from a standard 15 amp wall outlet. The RM 20 ships with a 20 amp line cord and can draw and deliver a full 20 amps when fed by a 20 amp circuit. Here is a slightly more technical guideline. Total the nominal current draw of the equipment to be powered via the Torus unit. Select a Torus Power unit which has current capability equal or marginally higher. For example, if the total nominal current of connected equipment is 19 amps choose the RM 20. Torus Power transformers drawing lower currents can be used. However, the full dynamic benefits of the Torus Power transformer will not be realized. Can you give a technical explanation of how the Torus transformer works to attenuate electrical noise, as well as reducing acoustic noise (to keep the unit silent)? The low pass filter characteristic of the Torus device is achieved in the toroidal transformer through the control of the leakage inductance and interwinding capacitances, combined with the proper choice of core material and careful design parameters. Torus Power transformers perform as a low pass filter with 12db/octave noise attenuation typically starting at 2kHz. Attenuation is 12db at 20,000Hz; 24db at 200,000Hz, and ~ 36 to 40 db at 500,000Hz. Beyond 500kHz, the attenuation reduces due to the increased influence of interwinding capacitances. Attenuation of noise levels of around 20db in the 2MHz frequency range. Plitron’s proprietary LONO technology is used to maintain the acoustic noise level below audibility. There is no gapping to the core, as the gapping itself would result in noise generation. The cores also have not been vacuum varnished, as varnishing effects the B-H characteristics of the core in a non predictable manner. I bought a Torus RM 20 several years ago when Plitron just developed Torus Power. Have you made any changes to that model? The RM 20 remains in the Torus Power line, unchanged, continuing to provide the same high performance as units produced in the past. One upgrade path you might consider would be to acquire the AVR20. This model will provide identical power conditioning performance as the RM 20, with additional features for voltage regulation and internet monitoring and control. If you do not require the additional features, then we recommend you continue to use the RM 20 originally purchased, which should provide excellent performance for the foreseeable future. Is it recommended to leave the Torus Power unit on at all times or is it preferable to turn it off when I turn off the connected equipment? It is preferable to leave the Torus Power unit on whether the connected components are off or on. The surge suppression circuitry is only active when the Torus Power unit is powered on. The pilot light on the front panel of the Torus Power unit will glow to indicate the unit is on. The pennies per day you spend on standby power are a tiny price to pay for the knowledge that your valuable components are protected from catastrophic electrical events. If the Torus Power unit is switched off for any reason (for example, if you go on vacation) we strongly advise you to unplug it from the wall. Important: If the Torus Power unit is powered off, and left plugged in, the lightning and surge protection will not be active. Is there a preferred sequence of plugging in equipment, e.g. analog sources closest to the power cord, then digital sources, then amplifiers (this sequence is recommended by some manufacturers)? There is no preferred sequence of plugging in equipment to the Torus unit. Full Torus Power benefits are available through all outlets to every connected component. However, it is recommended to switch on different equipment one at a time and not all at the same time. What is the benefit of using 240 Volt Balanced Input? The use of 240 Volt Balanced allows the Torus unit to draw half the output current from the power source. For example: the RM 20 BAL will provide 20A at the outlets to feed the connected equipment, but will only draw 10A from the 240 Volt balanced input source. As a result you get double the power, for a given current value, compared to the 120V power source. The RM 45, RM 60, RM 75 and RM 100 models allow the largest power systems to operate conveniently from a single piece of reliable equipment. Are the zones isolated from each other on the RM 60 and RM 100 units? The Zones on RM 45, RM 60, RM 75 and RM 100 are each controlled for the maximum nominal safe current drawn by either a 16A or a 20A circuit breaker, depending on the type of the duplex medical grade outlets used. However, every single outlet of every zone has access to the total available dynamic power of the whole unit. This means that all the zones are being fed from the same main output branch and are NOT isolated from each other. 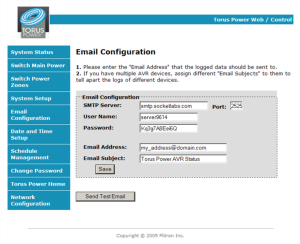 I am having difficulty in sending a test email from the Email Configuration screen in my Torus Power AVR or AVR2 menu. How can this be resolved? If the test email functionality does not seem to work, try setting the AVR / AVR2 to send email notifications to a different email address. Also, check your junk email folder to ensure the notifications are not being directed there. You may want to try a different port number such as 587 instead of the default port 25. If you have tried all of the above steps and the test email still doesn’t arrive, the issue may lie with your SMTP server credentials. We have had complete success using these credentials in the image. What is the method to calibrate the voltage and current readings on AVR and AVR2 units. To calibrate the unit, you will need to have the AVR powered and have Ethernet connectivity between the PC and AVR. The calibration is performed by applying fixed load to the AVR and measuring the input and output voltages and the output current. Goto http://avr/calibrate.htm [or http:// (IP address) /calibrate.htm] in your browser. 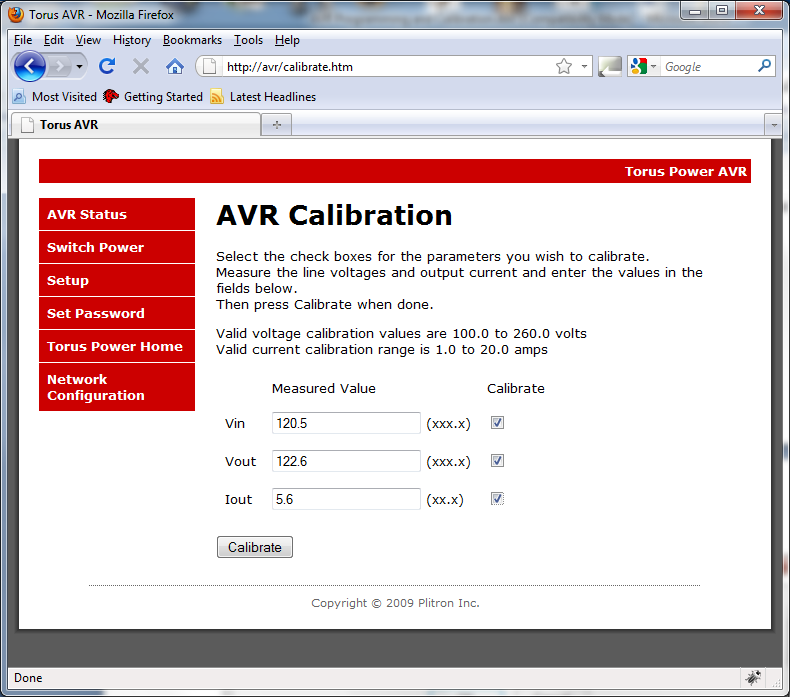 This will provide access to the calibration page where you can calibrate your AVR. Note: The IP address of the unit can be found on the display monitor by pressing the push button twice. The user name is ‘calibrate’ and the password is ‘plitron’. Follow the instructions on the web page. You can calibrate all three values at once or calibrate any combination of the three. 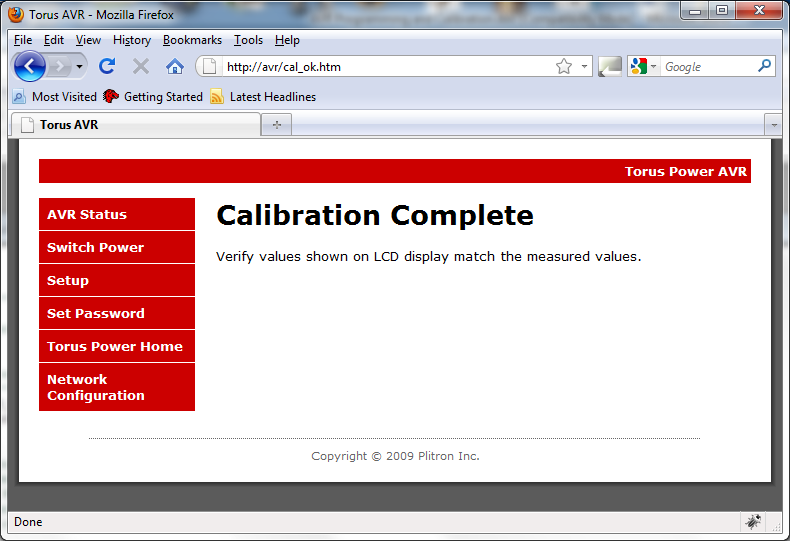 The check box must be checked for the parameters to be included in the calibration. Assuming valid values are entered, calibration is performed instantly when ‘Calibrate’ is pressed and the following screen is then displayed. Verify from the LCD or the web page that the displayed values now match the measured values.